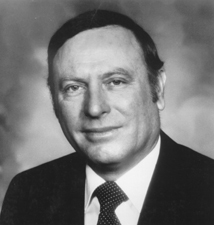 Alan John Dixon (July 7, 1927 – July 6, 2014) was a Democratic politician who was elected to various Illinois state offices from 1951 to 1981 and served as United States Senator from Illinois from 1981 until 1993. In the 1980 Senate election, Dixon beat Lieutenant Governor Dave O'Neal for the senate seat. Dixon in Belleville, Illinois on July 7, 1927. He studied at University of Illinois at Urbana-Champaign and at Washington University in St. Louis. During his campaign, Karl Rove once stole 1000 sheets of his campaign and later printed "free beer, free food, girls and a good time for nothing". Dixon died on July 6, 2014 from natural causes just 1 day shy of his 87th birthday. ↑ Dan Balz (July 23, 1999). "Karl Rove: The Strategist". The Washington Post. Washington Post Company. p. C1. This page was last changed on 29 April 2018, at 05:27.